Fun and Easy for Kids of Any Age. Here's How You Do It. 1. AT WHAT AGE SHOULD KIDS START USING SCRUB BUGS? Scrub Bugs are recommended for use by children age 3 years and up. Although the American Academy of Pediatrics (AAP) endorses hand washing in children as young as 6 months of age, it is not until approximately 3 years of age that a child will have the coordination needed to effectively wash their hands on their own with a Scrub Bug. Children younger than 3 years old will need the help of an adult to achieve optimal results. 2. WHY IS IT IMPORTANT FOR A CHILD TO USE SCRUB BUGS TO WASH HIS/HER HANDS? 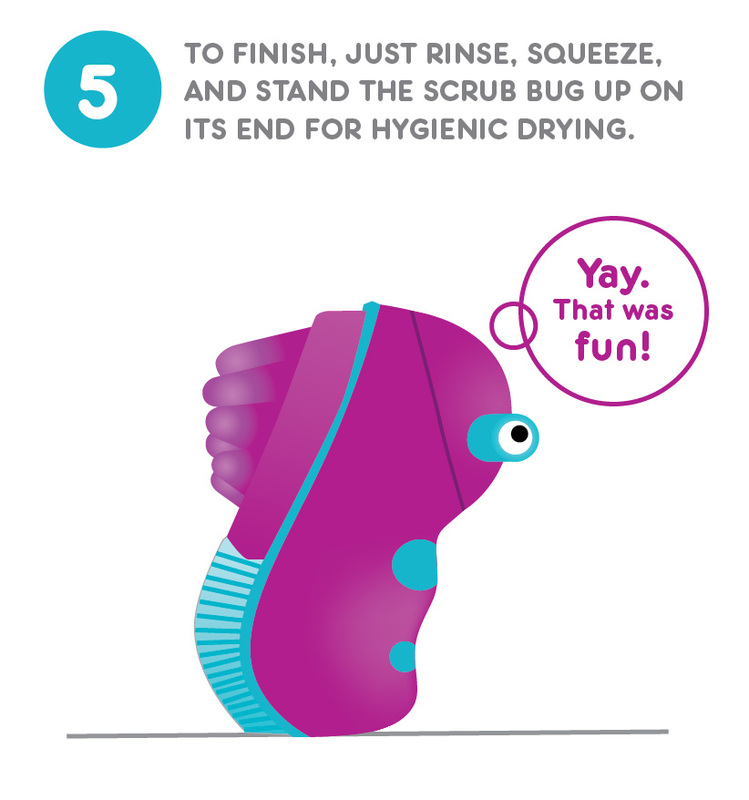 Scrub Bugs are proven to clean hands over 3X more effectively than ordinary hand washing. Cleaner hands mean fewer germs, which in turn keeps your children and you healthier throughout the year. According to the Centers for Disease Control and Prevention (CDC), keeping hands clean is one of the most important steps we can take to avoid getting sick and spreading germs to others. That’s because washing hands removes the dirt and sickness causing germs, which especially in young children, frequently come into contact with the nose, mouth, and other germ-rich areas of the body. 3. WHY IS IT BETTER TO WASH YOUR HANDS WITH SCRUB BUGS VS. USING HAND SANITIZER? The American Academy of Pediatrics (AAP) prefers hand washing to alcohol-based hand sanitizers whenever possible. The use of water and the gentle friction created when washing hands with Scrub Bugs removes dirt and germs from hands more effectively than simply rubbing hands together with hand sanitizer. In addition, certain types of germs are not effectively killed by alcohol-based sanitizers. The AAP has also expressed concerns that hand sanitizers are more toxic than soap and can be flammable. 4. HOW OFTEN SHOULD MY SCRUB BUG BE REPLACED? It is recommended that Scrub Bugs be replaced every 3-4 months in order to ensure you are getting the optimal hand wash. Squeezing the water out of the sponge after every wash and standing it up on its’ end will maximize the life of your Scrub Bug. 5. Can Scrub Bugs be shared among family members? There is no evidence that sharing a Scrub Bug among family members causes any potential health issues. 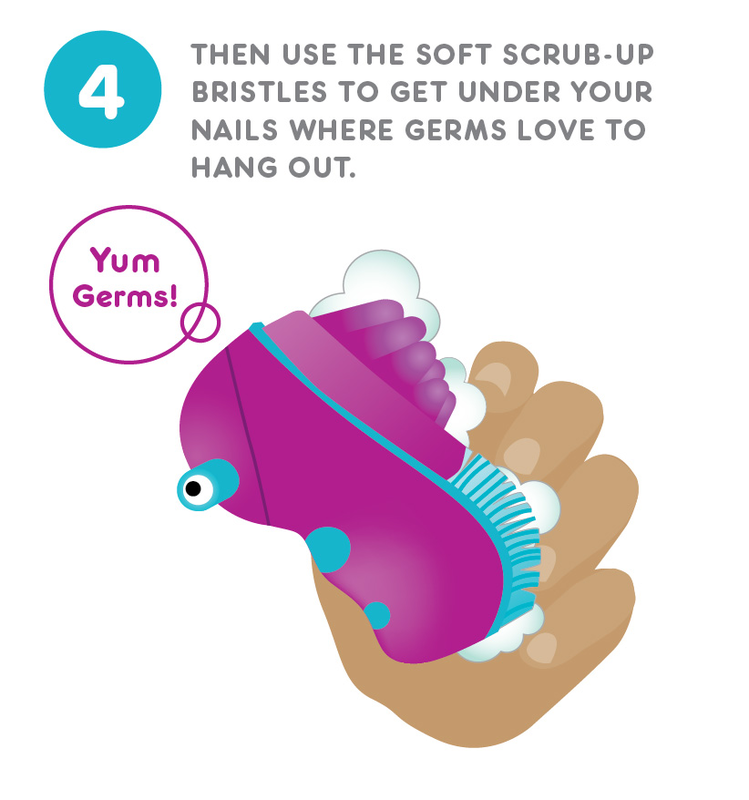 However, there is always a theoretical risk of germs spreading from one surface to another if someone is not feeling well, so we currently recommend that each child or family member use his or her own Scrub Bug. 6. IS IT POSSIBLE THAT USING A SCRUB BUG WILL ELIMINATE SOME OF THE "GOOD" GERMS? Some species of germs that live on our skin are considered to be good for our health in that they may prevent the growth of “bad” bacteria. That being said, there is no evidence to suggest that Scrub Bugs have significant effects on the bacterial balance in the body since their use is limited to the hands. 7. Are Scrub Bugs safe for all children? Scrub Bugs have been found to be both safe and effective for children; however we do recommend that kids with chronic skin diseases or significant forms of immunosuppression consult with their Pediatrician before using the product.